In this series of articles I plan on addressing the issues facing the modern-day musician. From gear to feedback, everything will be discussed accordingly... Can I be frank? This blog is really just a platform for airing the thoughts and (sometimes warped) views of a gigging muso in the 21st century. This blog is a must-read for the musically minded, the art lovers, the techies and above all else, the guitarists! You wonderful nutcases! It's 1967 and Paul Mccartney has just woken up in his London home. He steps outside with his morning cuppa to survey the day. It's fairly cold, having rained the night before, so he wastes no time in returning to the comfort of his living room, but as he turns around he's halted by what he sees before him. The three words are crudely marked onto the previously pristene white wall that surrounds his home. He shrugs and goes inside. When asked the following day how he planned on removing the graffiti, he replies, "I'm not going to remove it. I agree." 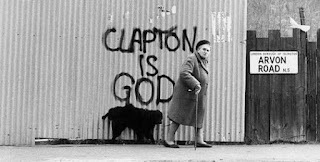 As it is the great man's 72nd birthday today, 30 March 2017, I feel it's time that we take a detailed look at Eric Clapton's 5 decade long career. What created the legend? How has he influenced music? Is his influence still present? Ah, the bassist! The member of the band whose name is rarely remembered and who is often asked to stand at the back for photoshoots (see AC/DC's Highway To Hell album cover if you don't believe me). I've always had a fascination with bass and the musicians who play the instrument. The unsung heroes. The guys and girls who lay the foundation for the rest of the musicians in the band to stand atop. The bassist has always had a raw deal, particularly when it comes to Rock bands. Of course, a few exceptions have stood out over the years, Jack Bruce, Flea and Geddy Lee spring to mind, but I've always felt that these guys, although being world-class musicians, came to be recognized not due to their insane skills, but more for their charisma and on-stage antics. So, this week, I'm paying respect to the largely uncelebrated masses by listing five of my all-time favourite bass players! There is no shortage of incredibly talented and charismatic guitar players in this world, but this piece is not dedicated to any one of them. This one goes out to five guitarists who, I feel, never received the recognition they so rightly deserve. Here goes! As much as I find the idea of an Australian singing Country & Not-So-Western a tad strange, I can't deny that Keith Urban's guitar chops are way up there! He has a great feel and his tone is beautifully Country with a touch of Classic Rock grit for good measure. I've always been impressed with his ability to play complex licks in between vocal measures without skipping a beat. The following live version of You Look Good In My Shirt showcases Keith's instrumental class. The world has lost an artist. A true artist. An artist we won't see the likes of for a very long time. Prince's musical genius cannot be overstated. A pop song writing machine from the age of 19, Prince's career went from strength to strength as he released hit after hit. 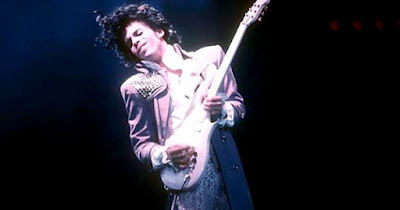 His mixture of funk, rock and soul transcended the barriers of race, as he amassed fans from every corner of the globe. His skills as a multi-instrumentalist were legendary, but what inspired me most, was Prince's guitar playing. I'm sure that every gigging guitar player has experienced that moment when you begin your solo, ready to blow the minds of every person in the place, but your fingers don't get the memo. Warming up before a gig is the best way to ensure that your playing is at the level you normally expect it to be at. 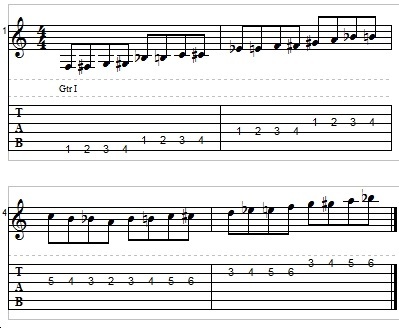 In the following article I'm going to go through a few of the exercises I've learnt over my career as a guitar player. The key to this exercise is that it's running chromatically, which gives most pentatonic-loving guitar players a bit of a brain wobble. I usually do this exercise first, just to get my fingers moving. Also, this exercise works best if you are using a metronome to keep time. Allow me to apologise on behalf of Joe Satriani for teaching you this exercise. It's a killer! It's April 2013, Coachella, and funk is filling the airwaves once again. Daft Punk's, then unknown, "Get Lucky" teaser is played to an audience of unsuspecting music lovers. The robots are shown jamming a truly epic funk track with none other than the father of funk, Nile Rodgers on guitar, and Pharrell Williams doing what he does best. The significance of this moment cannot be stressed enough. Funk, which had been laying dormant for thirty years, had finally made its way into popular culture once again. "Random Access Memories" started a funk revolution by establishing itself as the album of 2013/2014. In doing so, it set the stage for many great artists to capitalise on its success. Pharrell Williams, Olly Murs, Robin Thicke, Nick Jonas and many others contributed to this renaissance with their own brand of funk, but it wasn't until Mark Ronson, with the help of Bruno Mars, released "Uptown Funk" that I realised how powerful this genre was. When talking to any guitar player about solos, the usual suspects will no doubt be brought up, from the harmonically rich solo in "Hotel California" played by the guitar duo of Don Felder and Joe Walsh, to Jimmy Page's display of virtuosity in "Stairway to Heaven". Feel, feel feel! This solo is made of pure feel. It starts off small and never really gets any bigger, however, the attention it demands is what makes it the bit of musical gold that it is. Brian Green's old school jazzy tone is exactly what this song cries out for. It is smooth and unobtrusive. His control is also worth noting. Each note sits beautifully among the instruments in the rhythm section as well as the string arrangement. Each listen yields something new to appreciate.